If mankind only caught a glimpse of what infinite enjoyments, what perfect forces, what luminous reaches of spontaneous knowledge, what wide calms of our being lie waiting for us in the tracts which our animal evolution has not yet conquered, they would leave all and never rest till they had gained these treasures. But the way is narrow, the doors are hard to force, and fear, distrust and scepticism are there, sentinels of Nature, to forbid the turning away of our feet from her ordinary pastures. the opening of the whole lower being to the spiritual truth − this last may be called the psycho-spiritual part of the change. The spiritual transformation leads to the realization of the Cosmic Self. It is the equivalent of Enlightenment in other systems of Yoga. 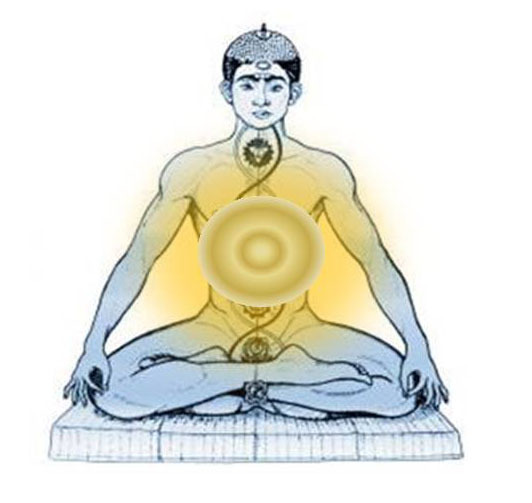 The Sahasradala Chakra is activated and one rises above the ordinary rational mind and begins to live in the Overmind. This is the state of Turiya, the fourth state of consciousness, described in the Upanishads. The concentration above the head coupled with aspiration initiates contact with the Jivatman/Central Being, which is located above the head and this starts the Ascent-Descent process. Please note that the phrase “Jivatman above the head” does not imply some absolute point in Space but just vertically relative to the human consciousness. During the descent experience, one feels the descent of Force through the head, neck and spinal cord. This inflow increases as the Brahmarandhra (i.e. door of Brahman) opens and widens. The descent of Sat (Existence) brings a sense of coolness in the head and back while the descent of Chit-Shakti (Consciousness) produces heat in the head and lower being. The resistance within the body substance gives rise to electric shocks, headaches and fatigue. The opening of the Ajna Chakra between the eyebrows brings visions. 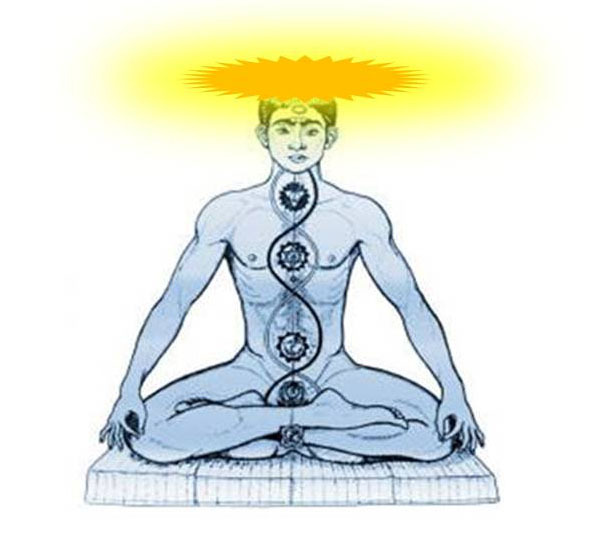 The descent of the Kundalini Force into the throat centre is experienced as heat over the face and neck. Further descent into the vital, physical and subconscient tranquilizes the habits and subconscious impulses within the being. 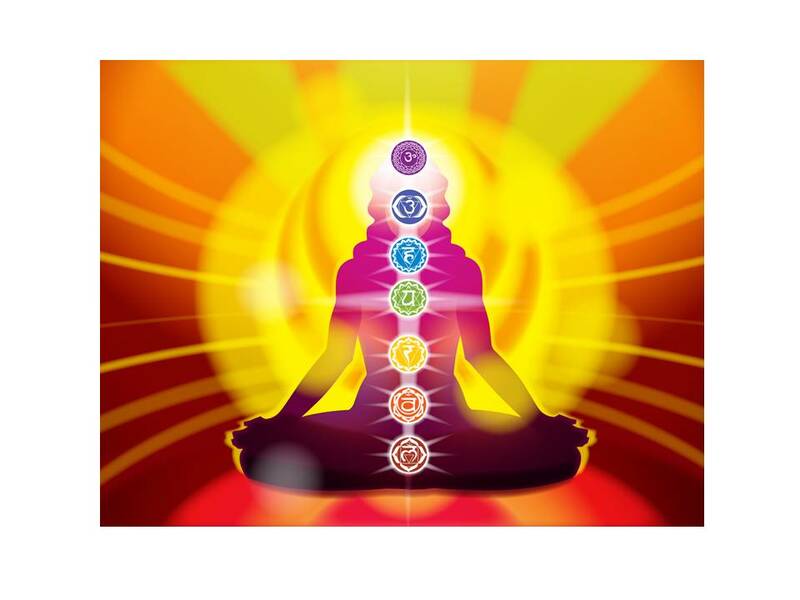 During the ascent process, the mental and vital sheaths of our body rise above the head and are purified by contact with the Superconscient at the Sahasradala Chakra. This brings about a lack of body consciousness and blankness of mind. The inner being opens to the cosmic mind, vital and subtle physical. The final result of this recurring ascent-descent-assimilation process is what is referred to as Liberation of the Soul. Memory is no longer the storing up of past knowledge but an abiding presence of knowledge that can be brought forward or offers itself when it is needed. Reason becomes an luminous organizer of the subjective and objective knowledge. Thought operates with an abiding sense of underlying unity with all objects. Sensory function operates independently of the sense organs and sense-mind, gaining awareness of all things on all planes. Vision opens to a direct knowledge of the past, the present and the future. The true direct supramental does not come at the beginning but much later on in the sadhana. First the opening up and illumination of the mental, vital and physical beings; secondly, the making intuitive of the mind, through will etc. and the development of the hidden soul consciousness progressively replacing the surface consciousness; thirdly, the supramentalising of the changed mental, vital and physical beings and finally the descent of the true supramental and the rising into the supramental plane. This is the natural order of the yoga. These stages may overlap and intermix, there may be many variations, but the last two can only come in an advanced state of the progress. Of course, the supramental Divine guides this yoga throughout but it is first through many intermediary planes; and it cannot easily be said of anything that comes in the earlier periods that it is the direct or full supramental. To think so when it is not so may well be a hindrance to progress. Click on the book to reach the SABDA site. Arpan, Thank you. I look forward to viewing them soon. WOW – what a synchronicity. l was only just now watching these on youtube, and wondering if l should post them on here, because they are excellent – and here Arpan has beat me to it LOL. l can hardly believe it. lt does make you wonder sometimes – l’ve had some weird [good] experiences on here. John stated: ” l’ve had some weird [good] experiences on here.” Agreed. … BTW, you remind me of a person–no longer here–named Mike. He left abruptly a few years ago. I considered him a friend. Cheerio! A major doubt that still assails me: how does it depend on the liberated-individual whether he wills to work for Supramental Transformation or just be content with his Liberation ? As Ramana Maharshi and various other masters state, isn’t it the will of the Whole which drives the individual-self ? (there, ofcourse, were frank differences of opinion between Ramana Maharshi and Sri Aurobindo). Any material from SA or Mother that addresses this clearly ? This term occurs in the Gita in Chapter 2, Verse 72 as well as in Chapter 5, Verses 24 thru 26. Sri Aurobindo points out the Gita’s definition of Brahma-Nirvana is different from the traditional Nirvana. Brahma-Nirvana means not negation but the loss of partial personality into a perfect being and the cessation of the ego into Brahman. The Gita after speaking of the perfect equality of the Brahman-knower who has risen into the Brahman-consciousness, brahmavid brahman sthitah, develops in nine verses that follow its idea of Brahmayoga and of Nirvana in the Brahman. “When the soul is no longer attached to the touches of outward things,” it begins, “then one finds the happiness that exists in the Self; such a one enjoys an imperishable happiness, because his self is in Yoga, yukta, by Yoga with the Brahman.” The non-attachment is essential, it says, in order to be free from the attacks of desire and wrath and passion, a freedom without which true happiness is not possible. That happiness and that equality are to be gained entirely by man in the body: he is not to suffer any least remnant of the subjection to the troubled lower nature to remain in the idea that the perfect release will come by a putting off of the body; a perfect spiritual freedom is to be won here upon earth and possessed and enjoyed in the human life, prak sarira-vimoksanat. It then continues, “He who has the inner happiness and the inner ease and repose and the inner light, that Yogin becomes the Brahman and reaches self-extinction in the Brahman, brahma-nirvanam.” Here, very clearly, Nirvana means the extinction of the ego in the higher spiritual, inner Self, that which is for ever timeless, spaceless, not bound by the chain of cause and effect and the changes of the world-mutation, self-blissful, self-illumined and for ever at peace. The Yogin ceases to be the ego, the little person limited by the mind and the body; he becomes the Brahman; he is unified in consciousness with the immutable divinity of the eternal Self which is immanent in his natural being. There is an aphorism of Sri Aurobindo which describes this state concisely. If when thou art doing great actions and moving giant results, thou canst perceive that thou art doing nothing, then know that God has removed His seal from thy eyelids. Thanks Mark. I read that portion of Essays on the Gita, as well as something similar in The Life Divine( Reality Omnipresent) giving Buddha’s example of how he was active and effective in outer life, post Nirvana and that must be a part of his original teaching too. Thanks for the quote, it’s powerful. Ascent and Dissolution Once the being or its different parts begin to ascend to the planes above, any part of the being may do it, frontal or other. The sanskara that one cannot come back must be got rid of. One can have the experience of Nirvana at the summit of the mind or anywhere in those planes that are now superconscient to the mind; the mind spiritualised by the ascent into Self has the sense of laya, dissolution of itself, its thoughts, movements, sanskaras into a superconscient Silence and Infinity which it is unable to grasp,—the Unknowable. But this would bring or lead to some form of Nirvana only if one makes Nirvana the goal, if one is tied to the mind and accepts its dissolution into the Infinite as one’s own dissolution or if one has not the capacity to reorganise experience on a higher than the mental plane. But otherwise what was superconscient becomes conscient, one begins to possess or else be the instrument of the dynamis of the higher planes and there is a movement, not of liberation into Nirvana, but of liberation + transformation. However high one goes, one can always return, unless one has the will not to do so. Ofcourse, Krishnaprem’s view about the canalisation of Niagara is my standpoint also. But for the human mind it is difficult to get across the border between mind and spirit without making a forceful rush or push along one line only and that must be some line of pure experiencein which, especially if it is the bhakta way, one gets easily swallowed up in the rapids (did not Chaitanya at last disappear in the waters?) and goes no farther. The first thing is to break into the spiritual consciousness, any part of it, anyhow and anywhere, afterwards one can explore the country, to which exploration there can hardly be a limit, one is always going higher and higher, getting wider and wider; but there is a certain intense ecstasy about the first complete plunge which is extraordinarily seizing. It is not only the bhakta’s rapture, but the jnani’s plunge into Brahma-Nirvana or Brahmananda or release into the still eternity of the Self that is of that seizing and absorbing character —it does not look at first as if one could or would care or need to get beyond into anything else. One cannot find fault with the Sannyasi lost in his laya or the bhakta lost in his ecstasy; they remain there probably because they are constituted for that and it is the limit of their leap. But all the same it has always appeared to me that it is a stage and not the end; I subscribe fully to the canalisation of Niagara. Only one assertion of Maharshi: Jnani has no sankalpa except what Self puts in him does not seem to be true in sense of how ppl perceirve Sankalp/Will. I understand it as: Consciousness is complex. Even though theoretically every human being can become a siddha, but if circummstamces never awaken him to that possibility or even its desirability, he, in one sense can’t become a siddha and that’s how one can say that it all depends on destiny/grace etc. In the 1st letter I quoted, SA says that one might take mind’s dissolution ad dissolution of oneself, so though one can theoretically return, but he may simply not get the required impulse do so. I think it should also be stressed that many yogi’s etc. believe they’ve attained (Ramana was only Psychically realised according to SA. That’s why he never experienced the Descent of Consciousness) the highest state of realisation but in reality have only gone half way or perhaps to some vital or mental world. SA and M go into this extensively – SA especially in his letter on the ‘lntermediaye Zone’. The Mother also said near the end of Her life that most of those who thought they had reached the Highest were only half way there. Can you post a link for that letter of SA on Intermediate Zone ? Nirodbaran: Does he believe in transformation of this life? Satyendra: No. He says he has no such Sankalpa (will). Dilip asked him once what he thought of your idea of ascent, descent, transformation, etc., and whether he wanted to change earth-life. He replied that there was no Sankalpa in him for it. Sri Aurobindo: The Mother also believes in Sankalpa, as you can see from what she said to Paul Brunton when he asked her what he should do. She said, “You have to follow whatever will arises in you. When you have realised the Self, the Self will choose for you what to do.” That is another thing European minds can’t understand. They think all spiritual personalities must be of the same fixed type. This is exactly what I have heard most of those who have attained Adwaitin realization say. SA himself talks about “not having the sankalpa to earn money” in another talk. That seems to show that Maharshi did not have a “choice” in the matter. Whether he participates in Transformation or not would be determined by the Self, which he already lives in. I don’t recall SA saying anywhere Ramana Maharshi was only psychically realized. He had full Self-realization but did not feel any call to go further. l tried posting the link but it didn’t go through. A quick search for ‘aurobindo’s letter on the intermediate zone’ will bring it up. lt’s a bit long to post here. Read that letter. It’s astounding if Intermediate Zone applies to Ramana Maharshi’s realization. Does ritual have any place in Integral Yoga? If by ritual you mean something which is perpetuated despite losing its original spirit and living form, then “no”. That can certainly happen but more often it does retain its original sprit and living for. Like specific prayers, due of incense, fire, water, etc. I have found incense helpful to induce a meditative trance. Can you be more specific on what ritual could be a problem ? What do you think of Buddhists who circumambulate a holy mountain or draw Mandalas ? Mark, Thanks for posting the ‘link’. Yes Sandeep, your quite right, my mistake. l just thought when SA said ‘“In Maharshi’s case he has received the thing in the heart and has worked with it”, He must have mean”t Ramana had the ‘Psychic Realization’ rather than ‘Self-Realization’ which are two different things in lntegral Yoga. But, as you say, SA never pronounced on Ramana’s actual state of Realization. l’m pretty sure Ramana didn’t belong to the ‘lntermediate Zone’ – gurus like mother meera and sai baba would be in that category, l think (Nolini saw mother meera at the ashram years ago and said – ‘that woman has a vital power. Good enough for me). l believe they transmit a power from those regions and also (esp. in sai baba’s case) use little entities from there too. accepted as the highest truth or the best” – Letters on Yoga. He said that about Swami Vivekananda, but l think the same would apply to anyone who doesn’t have the Supramental Knowledge. He did disagree with Sri Ramakrishna and Ramana on several issues.